1Department of Pharmacognosy, Faculty of Pharmacy and Pharmaceutical Sciences, Kwame Nkrumah University of Science and Technology, Kumasi, GHANA. 2Department of Pharmacology, Faculty of Pharmacy and Pharmaceutical Sciences, Kwame Nkrumah University of Science and Technology, Kumasi, GHANA. 3Department of Pharmaceutics, Faculty of Pharmacy and Pharmaceutical Sciences, Kwame Nkrumah University of Science and Technology, GHANA. 4Department of Herbal Medicine, Faculty of Pharmacy and Pharmaceutical Sciences, Kwame Nkrumah University of Science and Technology, Kumasi, GHANA. Introduction: The roots of Capparis erythrocarpos are used traditionally across Africa for the management of pain, arthritis and other forms of inflammatory conditions. Owing to its proven efficacy, it has gained commercial value, particularly as a key ingredient in several herbal products and alcoholic beverages. The increased scarcity owing to demand outstripping supply lend the roots of C. erythrocarpos to adulteration. 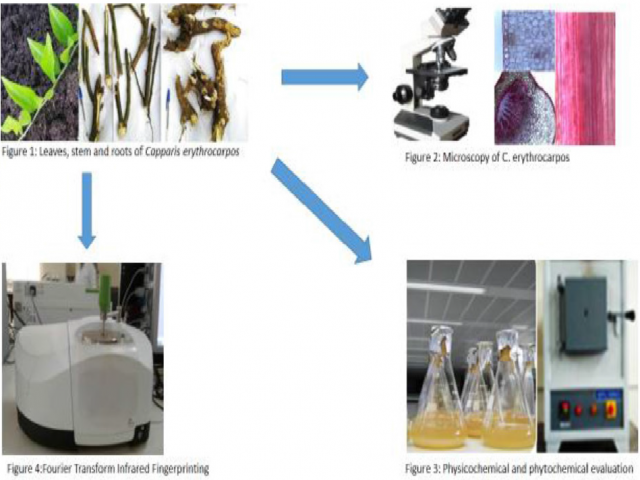 This paper presents a detailed pharmacognostic evaluation of the leaf, stem and root of C. erythrocarpos which will be used in its identification and consequent standardization. Methods: The leaf, stem and root were evaluated for their macroscopic and microscopic features as were the physicochemical parameters and phytochemical screening done. Results: Leaves are alternately arranged, have collateral vascular bundle, crystal sheaths and a pericyclic fibre. Actinocytic stomata and secretory cells were contained in powdered leaves. The stem showed lenticels and thorns, stellate and branched trichomes which leave off cicatrices in older stems. The powdered stem and roots contained stone cells, secretory cells and scalariform vessels. However, the roots lacked thorns, trichomes and had smaller secretory cells. Aqueous and ethanolic extracts of the leaves, stem and roots were slightly acidic to neutral. Ash values of leaves, stem and roots are (16.58 ± 0.09) % w/w, (5.01 ± 0.09) % w/w and (6.53 ± 0.19) % w/w respectively. Preliminary phytochemical screening of the leaves, stem and roots showed the presence of glycosides, flavonoids and tannins. Conclusion: The determined parameters for the leaf, stem and root of C. erythrocarpos constitute quality parameters for their unequivocal identification. A TM, Edmund E, K MP, E B-, LK MM, Eric W. Pharmacognostic Studies of the Leaves, Stem and Root of Capparis erythrocarpos Isert (Capparaceae). Pharmacognosy Journal. 2019;11(1):112-118. Pharmacognostic and free radical scavenging Evaluation of Cyathula prostata (Blume) L.